Adventure awaits you and your family on this action-packed, kid-friendly journey into spectacular Glacier National Park on our Glacier National Park Family Vacation. Join our expert guides as they introduce you to the majesty of rugged mountains, jagged glaciers, turquoise-blue alpine lakes and wildflower-studded meadows animated by the occasional mama bear and her rambunctious cubs. 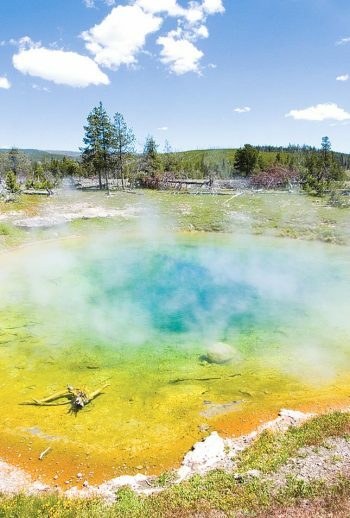 Hike, bike, raft and uncover the wild west history of this UNESCO World Heritage Site as your kids solve the mysteries of the flora, fauna and folklore of the region. This all-inclusive Montana vacation package presents the perfect itinerary to fully experience Big Sky Country, featuring best-in-class travel and Austin’s signature touch of inspired, thoughtful service. You’re invited to kick back and spend time with the family while nature speaks for itself, all the while enjoying the tastiest in regional fare and cozy accommodations at iconic park properties set against the dreamy backdrop of awe-inspiring grandeur in one of America’s most celebrated national parks, all included in our Glacier National Park Family Vacation Package. Known to the Native Americans as the “Shining Mountains” and the “Backbone of the World,” Glacier National Park preserves over a million acres of old growth forests, alpine lakes, rugged mountains and sweeping wildflower meadows, and you’ll see it all on our Glacier National Park Family Vacation. 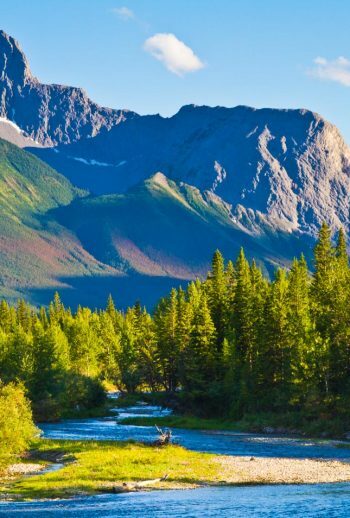 Boasting more than 750 miles of maintained trails, one of the most scenic stretches of paved road in North America, and a river equally as suited for rafting as it is gazing at the surrounding beauty, the Park’s unique, glacier-carved terrain is an adventurer’s paradise. Going-to-the-Sun Road: This iconic stretch of highway spans 50-miles through Glacier park, around (and through) mountainsides and over the Continental Divide at Logan Pass. Rising Wolf Mountain: Rising Wolf Mountain's name comes from the Blackfeet Indian's name for the mountain, "Mahkuyi-opuahsinI," which translates to "the way the wolf gets up." Iceberg Lake: this picture-perfect lake is the perfect spot for brave souls to embark on a polar bear plunge! Our adventure begins in the hip western town of Whitefish. After an introductory welcome meeting in town, we begin our two hour drive towards East Glacier and head over to a lakeside picnic lunch. This afternoon, we play around Lower Two Medicine Lake, flanked with steep mountains that serve as the perfect backdrop for an afternoon of adventure. Once you arrive at Rising Sun Motor Inn, take time to settle in and relax before heading to dinner with your group. Situated a short drive from St. Mary Lake along the Going-to-the-Sun Road, Rising Motor Inn’s rustic cabins and motor inn rooms offer a view of soaring mountain peaks in every direction. It’s central location allows for access to an abundance of hiking trails and the Motor Inn rooms, resting on a hillside, provide guests with never ending scenes of Glacier National Park’s grandeur. This location includes Two Dog Flats Grill, general store, and gift shop. Early morning wake up and shuttle north, deeper into the park, to the trailhead of Iceberg Lake, considered by many the “Crown Jewel” of hiking trails in the park. Iceberg Lake Trail offers one of the most scenic hikes on the planet. 4.5-miles in will seem a short distance as you enjoy panoramic views, watch for mountain goats, big horn sheep and of course, bears. Your reward at the end of the trail? A jaw-dropping view of giant limestone cliffs and ice fields shooting up from the pristine blue waters of the alpine lake below. If you’re feeling adventurous, take a dip into the iceberg dotted lake! After lunch at the lake, we’ll hike back to our shuttle and continue on to our home for the next two nights, Many Glacier Hotel. Many Glacier Hotel, located in the northeastern part of Glacier National Park on the shores of Swiftcurrent Lake, boasts a true Swiss atmosphere from the alpine beauty that surrounds the building to the themed architecture and decor of the striking atrium lobby. The hotel was declared a National Historic Landmark and listed on the National Register of Historic Places on September 29, 1976. In keeping with the era in which the hotel was built, the rooms offer guests modest amenities and old-world style accommodations resulting in a one-of-a kind, National Park lodging experience. Today we trek to one of the many backcountry lakes of the park. After awakening in the Many Glacier Valley we hike alongside Swiftcurrent Lake and soon after, Lake Josephine. Upon reaching Grinnell Lake, kick back and relax as you reflect on the stunning scenery around you. The lake is named after George Bird Grinnell, an early American conservationist, explorer, and founder of the Audubon Society, who was so inspired by the scenery during his first trip to the area in 1885 that he spent the next two decades working to establish it as a national park. Take your time heading back to the trailhead, and this evening enjoy a night on your own in Many Glacier. Today’s the Big Day…the day we explore the famous Going-to-the-Sun Road (east to west). As the sun lights up the peaks, we’ll take in the beauty of the 40 mile drive to Lake McDonald with frequent stops along the way to watch for mountain goats and the ever present grizzlies. Near the beginning of our journey, we’ll stop and enjoy a neat hike to several picture-perfect waterfalls. On the other side of Logan Pass, we’ll stop to eat a picnic lunch overlooking a stunning view of the western valleys. Upon arrival to Lake McDonald, head out on a short boat tour taking in the majesty of the Continental Divide and the tranquility of the emerald-hued lake. Dinner tonight is at the Belton Chalet. Lake McDonald Lodge opened its doors on June 14, 1914, and is a three-and-one-half-story structure built on the eastern shore of glaciated, picturesque Lake McDonald. In keeping in the era in which all of the rooms were built, they offer guests modest amenities and old-world style accommodations resulting in a one-of-a kind, National Park lodging experience. The floors of the lobby have incised messages in Kootenai (a local Native American dialect) that translate into phrases such as “welcome”, “new life to those who drink here”, “looking toward the mountain” and “big feast”. The main lodge was declared a National Historic Landmark and listed on the National Register of Historic Places in 1987. This morning, we shuttle to the Flathead River for a morning of rafting on perhaps not the wildest of rivers, but definitely one of the prettiest. Enjoy a gourmet picnic lunch prepared by your guides. This afternoon, we drive to Whitefish through the Flathead Valley amid the Swan, Mission, Salish and Whitefish mountain ranges of northwest Montana. Be sure to keep your eyes open while cruising through these breathtaking landscapes. Dinner tonight is at Tupelo Grill. Grouse Mountain Lodge’s front doors welcome you to upscale comfort and an authentic Whitefish, Montana lodging experience. The fantastic location leads you to exciting year-round adventure. With 143 beautifully appointed guest rooms, fresh and exciting cuisine in Logan’s Bar and Grill, an indoor pool, outdoor hot tubs, day spa, and a substantial list of services and amenities, Grouse Mountain Lodge is one of Montana’s finest lodge resorts. Guest rooms combine warmth and appeal with design and spaciousness to provide that pampered feeling. This morning we have time for one last hike in the Whitefish area. Transfer to either your Whitefish hotel or the Kalispell airport for your departure home. ** Trip itineraries are subject to change without notice due to road, weather and other factors outside of our control, for the safety and enjoyment of our guests, as deemed necessary and appropriate by Austin Adventures. Please plan on arriving at least one day prior to your trip departure. Day one of your itinerary starts at 8:00 am or 8:15 am, depending on your hotel. Your trip ends with a drop-off at your Whitefish hotel (1:30 pm) or the Kalispell airport (2:00 pm). Hiking: 4 to 10 miles per hike, moderate to challenging terrain. Day 2 hike to Iceberg Lake considered strenuous at 9.7 miles out-and-back with 1,275 feet elevation gain. Whitewater Rafting: Class II-III, no experience necessary. Austin Adventures guides are experienced facilitators and regional experts. They will take the time to explain the details of each activity, answer any question, and demonstrate the use of all equipment. Each activity has been carefully planned to include options for all levels. Most importantly, Austin Adventures guides will help you select the distance that’s right for you. Glacier National Park is the world’s first International Peace Park and a UNESCO World Heritage site. Explore the park’s outstanding scenery and diverse flora and fauna with our expert guides. When you reach the top of Logan Pass on the infamous Going-to-the-Sun Road, imagine what this high point looks like buried under 80 feet of snow mid-winter…and then think about the amount of snow removal equipment required to plow this spectacular, winding two lane road – amazing! See for yourself why Iceberg Lake and the trail leading up to it are considered “crown jewels” of the Treasure State. Hunt for the hundreds of different wildflowers that reside in the park: Bear Grass, Lupine, Fireweed, and Indian Paintbrush are just a few of these colorful beauties you might come across. Learn about the Flathead Indian Reservation tribes: the Bitterroot Salish, Kootenai, and Pend d’Oreilles – all tribes whose histories intertwine to form the anthropological past of the Flathead Valley. Discover massive U-shaped valleys, cirque lakes, horns, cols, moraines, and arêtes in this glacially carved land. Come play in Big Sky Country! The hallmark of an Austin vacation is our exceptional dining. All meals: breakfasts, lunches, snacks, dinners, refreshments and receptions – except one dinner on your own – are included as indicated by itinerary. (B = Breakfast, L = Lunch, D = Dinner). Alcoholic beverages and related gratuities are not included in the trip price. Double occupancy rooms with private baths. Rooms often accommodate 3 or 4 people. What will you see, and how will it impact you? A professional photographer by trade, and an avid traveler by upbringing and choice, Andy Austin excels at helping you focus on the life-changing value of Austin Adventures activities and destinations—and he might just have a few tips for how to capture all those memories in your own camera lens, too. As a guide, Andy is known for surprising guests with trailside creme brulee and impeccable customer service, but he wears many hats at the company and will gladly tell you anything you need to know.